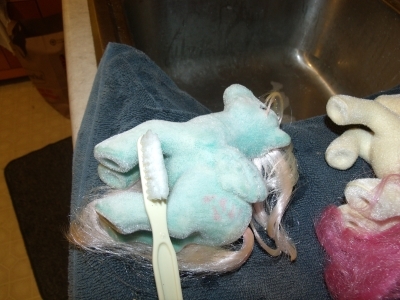 I wash my so soft ponies gently with Dawn dish detergent and a very soft toothbrush. I think any washing changes the texture of the flocking but I find that this method leaves it very soft while getting off most dust and surface dirt. 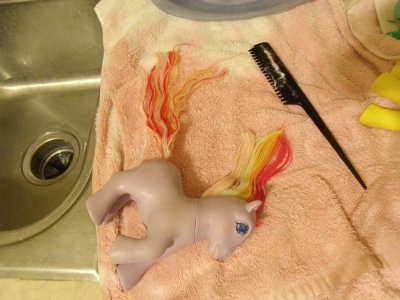 I also wash their hair with the same shampoo and conditioner I use on all my ponies. 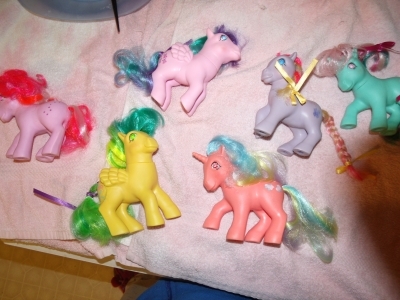 I think any conditioner tends to stick to their flocking so you have to be sure to rinse them really well. In the far right picture I have bandages on my wrists because I had picked up a fungal infection from a dog at work (I'm a trainer at an animal shelter). I was supposed to keep it covered, clean, and dry. Dry? 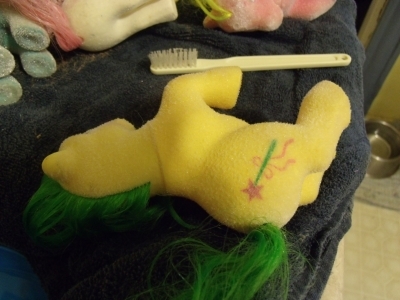 Cleaning ponies is much more important!!! 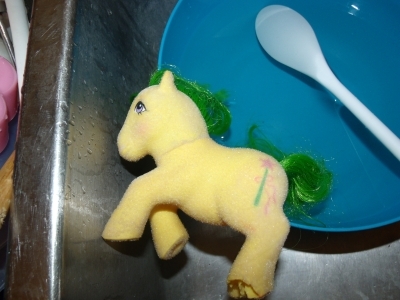 I wanted to try soaking a SS pony in bleach to see what would happen, especially since reports on this method vary so much. Most of my white so softs are in pretty good shape so I didn't want to risk ruining them. My Magic Star was absolutely awful so I wasn't worried about testing on her. You can see in the photo that not only is she missing a foot but she had ingrained dirt that just wasn't coming off. 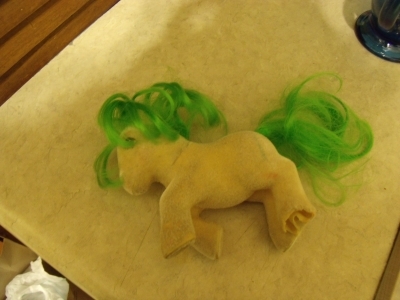 The texture of her flocking was also rough and patchy. 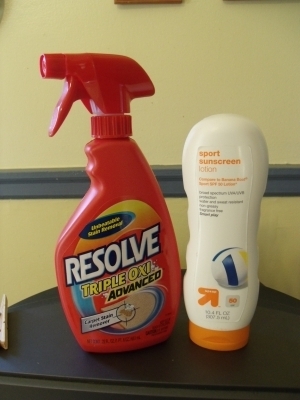 I guessed how much bleach to use. I think I put in a half cup of bleach into a large mixing bowl filled with water. It was strong enough to smell the bleach but not overwhelming. I think the results for her were great. 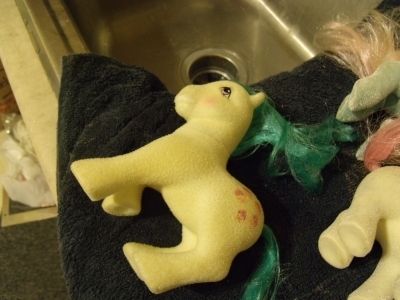 The bleach solution removed all the ingrained dirt and I think her flocking is a much nicer texture now. As you can see it didn't harm her symbol or eyes, and didn't fade her hair. 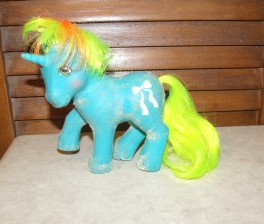 It did do something to the texture of her glue and made the flocking really easy to rub off. 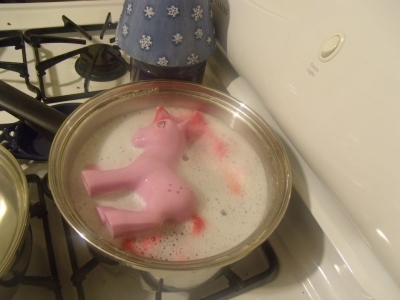 It got better once she was dry but I would be very careful using this method. My husband realized awhile ago that rub on sunscreen removes sharpie from your skin. 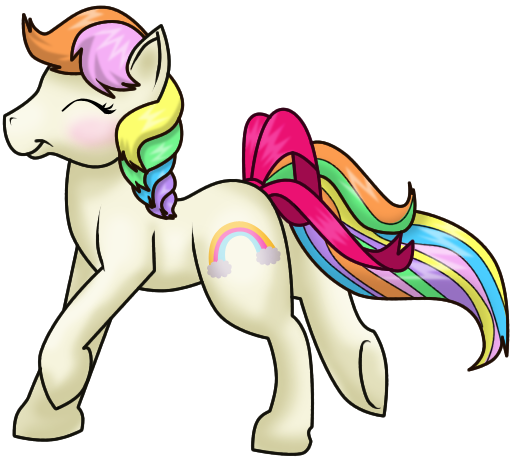 He thought it might whiten ponies so I tried it on cupcake but it had no effect at all. BUT, now you know what to do if someone jokingly writes on your face with sharpie while you're asleep ('cause we NEVER did that in college!). bad. I would probably do it again for colored so softs with bad dirt build up. 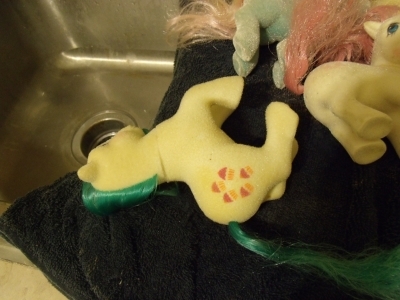 I think the theories that results vary based on how the glue has aged are probably correct. My curls are starting to turn out better but I'm still struggling with bits of hair sticking out and slipping off the curlers. I'm struggling with holding them on by wrapping the tips in paper towel with bobby pins or rubber bands as well. The first photo is of partially de-flocked SS Ribbon. This is her after being scraped with acetone. Yes, I'm a fraud. 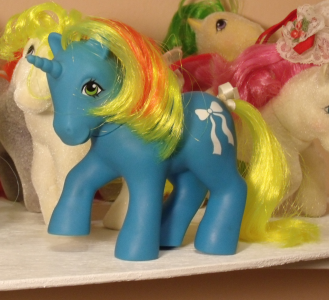 I'll buy upgrades if I really don't like the shape of a pony. It takes a lot for me to feel the need to upgrade and I didn't plan on it with Ribbon. 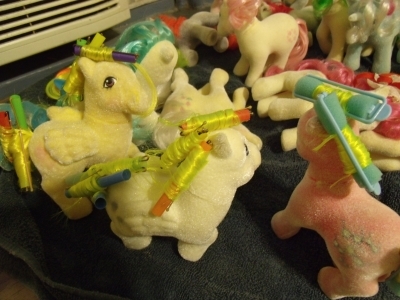 I got the de-flocked one for $5 at the 2011 VA pony meet. I mean geeze, I probably spent $5 on the acetone for her alone. What was the point in spending the money on the Jasco and hair for her when I could get one with original hair? 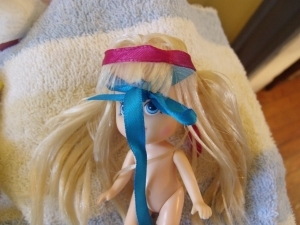 I feel a little guilty, like I've betrayed my first ribbon. Pretty, clean, semi-curled girls! 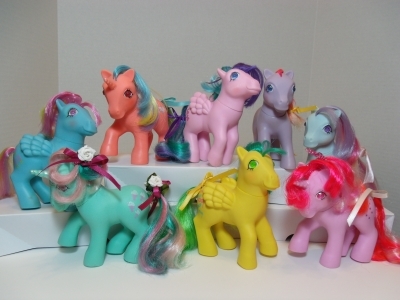 I'm really torn over whether or not to de-flock Twist. He looks so grey under his flocking and he's actually such a gorgeous purple! I eventually did decide to de-flock Twist. 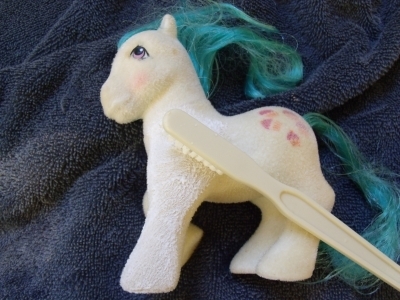 He also needed his forelock re-haired. 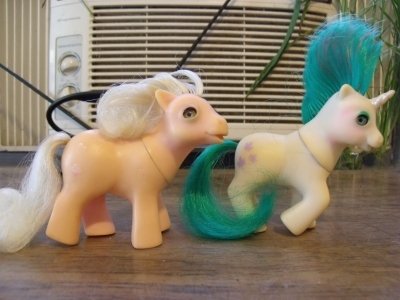 Here are the results!​​​​ You'll find the steps I use for de-flocking under the 2nd Set So Soft Ponies as I had to do more to that pony. It's not like I'm an expert at it anyway! I've only needed to do it twice. 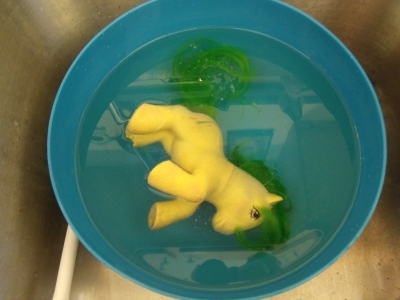 All of my TE's have rubbed pearly eye paint so I went ahead and gave them an OxiClean bath. It did not take off any of the paint that was left. 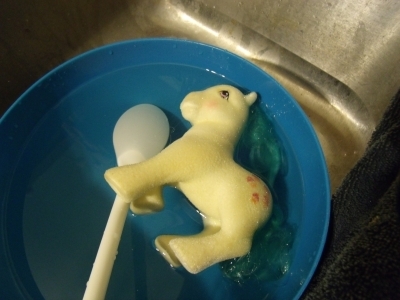 However, I don't use boiling water and I don't leave my ponies in for very long. 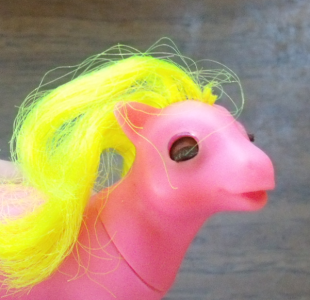 Sky Rocket is proof that even the nastiest tangled messes can be defeated with enough conditioner. I don't really get the whole "TE's look like zombies without their pearly eye paint." thing. I think they're cute regardless and are one of my favorite sets. 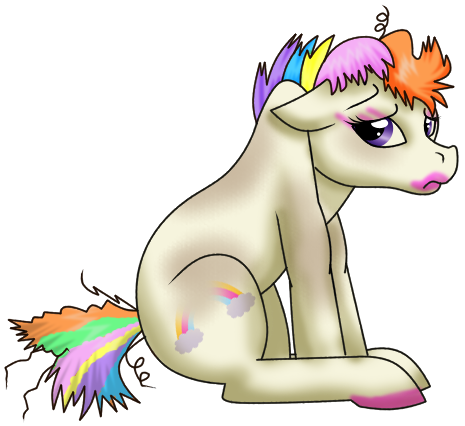 I went ahead and tried painting pearlizing medium on Galaxy's eyes and didn't really like it. I took it off. I think this is one of those personal preference things. I'm torn with these girls because I love LOVE their hair. To get the curls to hold I drenched them in hairspray a few years ago. 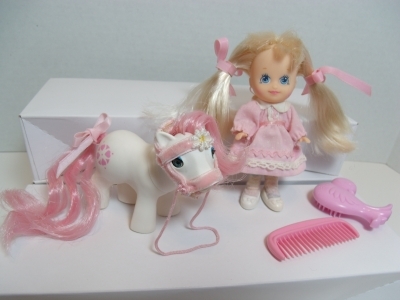 RoseDust's hair is starting to yellow, I'm guessing because of the hairspray, so it's got to go. 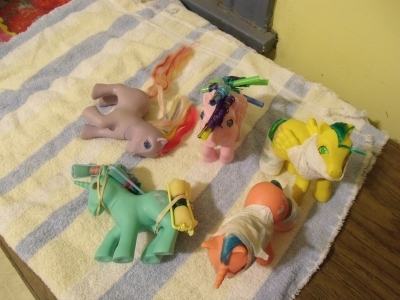 They all got an OxiClean bath which turned out to be a mistake because all of their wing tabs either melted or shrunk. Yes, MELTED!!! 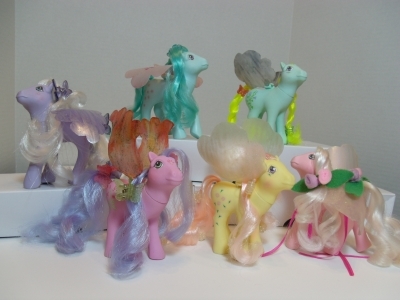 They all got new wings using the plastic bottle method found at: Little Pony Heaven. I bucked against using any glue, but since I managed to melt their wing tabs I had to in order to get the wings to stay in place. I used either tacky glue or super glue depending on how bad the wing tab was. 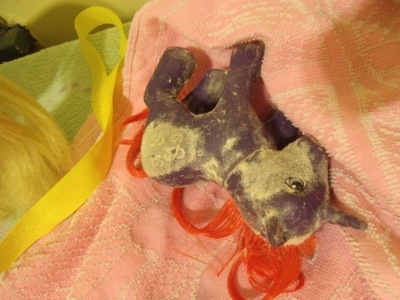 With a wash and conditioning the yellow came out of RoseDust's hair with no trouble. Here's a couple more of my originals. 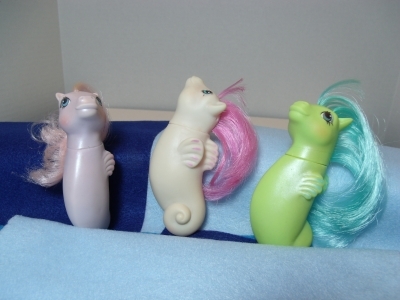 Baby Lickety Split was my sister's and Baby Gusty was mine. If you look closely at the photo, Baby Gusty's face is partially colored pink. 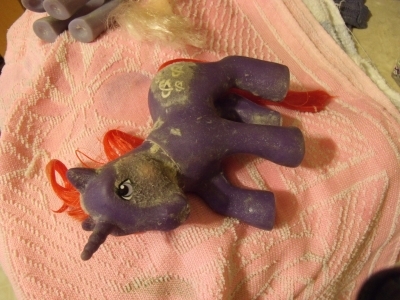 I was upset that he wasn't pink like the rest of my ponies so I decided to color him pink with a crayon. My mom caught me and made me stop. Since he had a mohawk and "war paint" he became my Indian pony. 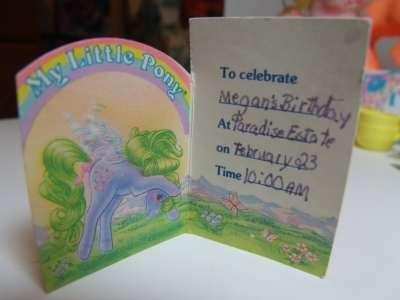 I was a very PC child. As with most of these, the biggest issue with my BBE babies is their rusty eyes. Even my Baby Shady is in decent shape. She's one of the few I've seen who's head matches her body. I tried cleaning the rust off with whitening toothpaste and got nowhere. All I managed to do was scratch the paint on their eye lids and rub off some of their eyelashes. I'll be picking up some Rit rust remover and will give that a try in the near future. I know a lot of people would think I'm crazy but I actually really like the BBE's. 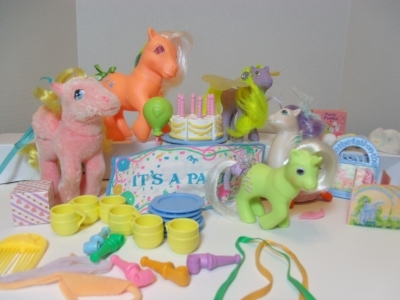 Baby Ribbon is one of my favorites (don't tell the others, it would hurt their feelings!). These are upgrade Baby Lickety Split and Gusty. See where I rubbed the eyelashes clear off of Baby Lickety Split? I also see some mohawks trying to sneak back! 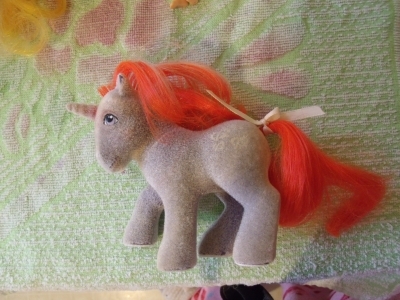 It doesn't show up too well in the photos, but some of the so soft ponies had brown spots that seemed to be under the flocking that didn't come off when washed. I tried this Oxy spray stuff but that didn't do anything to it. 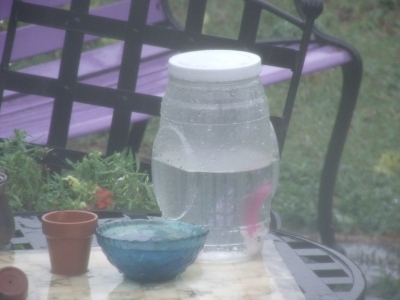 Our area of Virginia got the edge of Hurricane Irene. 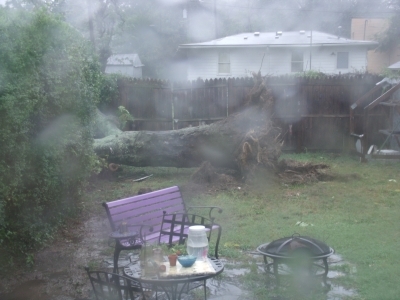 A big tree in our yard went down and our power was out for more than a week. Ripple was outside in a jar getting a hydrogen peroxide soak while we were busy bringing in yard ornaments and things like that. Stephen said we didn't need to bring in a lot of things, including Baby Ripple. Something about center of gravity. I love my husband, but he is a total know it all. I agreed to leave her out, mostly out of curiosity. He agreed he'd get me a new one if anything happened to her. Darn if he wasn't right! 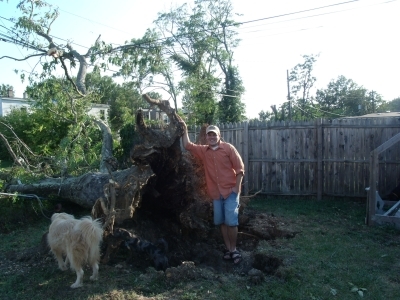 Baby Ripple sat through the entire storm and never budged while an entire tree fell over! 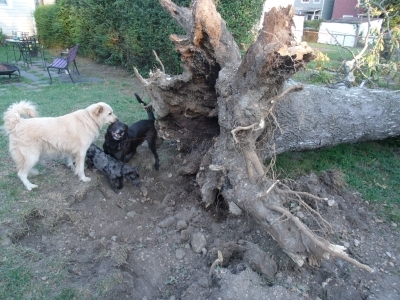 If we'd known the center of the tree was that rotted we would have had it taken down ages ago. At least it didn't hit anyone's house. The dog's thought the giant hole it left was the greatest play ground ever. 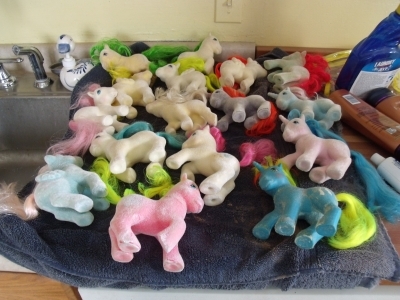 If anyone wonders why it takes so long for me to get ponies unpacked and fixed up, and why it takes so long to make website updates, this type of thing is a good example. And for anyone who complains that their life gets in the way too much to complete swaps they've signed up for . . . I've only participated in one swap and everything got to my partner just fine. Half the shopping days and the ship dates fell while we were doing all the clean up and our power was out. So stop your whining! Continue to Year 5 . . . 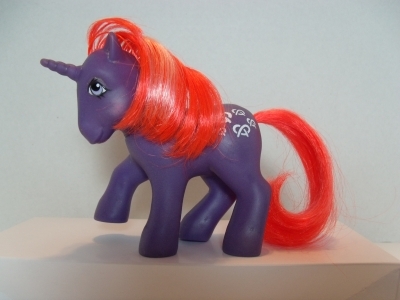 I got the idea to use hair from his tail to re-hair his forelock from someone at the Arena, although I can't remember who. It's freakin genius and I don't know how I never thought of it. It gives you an exact hair match, is totally free, and as long as you don't take too much you can't see any difference in the tail. ﻿I'm sure I did the actual re-hairing totally wrong. 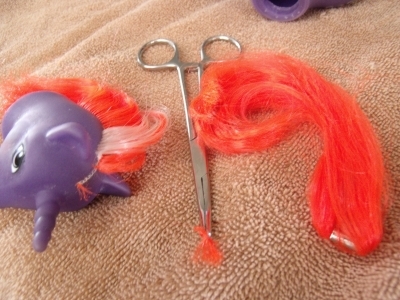 I pulled out the forelock using my hemostats, I don't think I could survive without these. 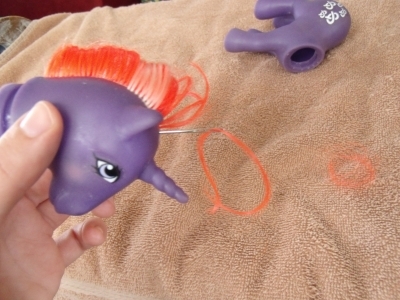 Then I pulled the hair through the empty plugs with a needle and held them in place with tacky glue. I know people usually knot the hair, but I couldn't figure out how to do that. It's quite the improvement, I think. The ribbons here were my attempt to get Molly's bangs to behave . . . it didn't work. ﻿Continue to Year 5 . . .